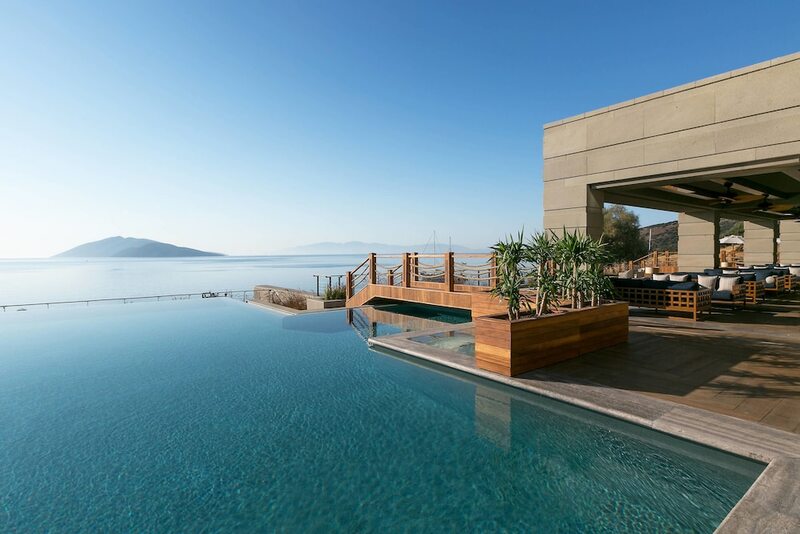 With a stay at Caresse, a Luxury Collection Resort & Spa, Bodrum, you'll be centrally located in Bodrum, a 3-minute drive from Bitez Beach and 14 minutes from Camel Beach. This beach hotel is 4 mi (6.5 km) from Bodrum Beach and 17.6 mi (28.3 km) from Port of Kos. Make yourself at home in one of the 77 air-conditioned rooms featuring minibars and espresso makers. Your bed comes with premium bedding, and all rooms are furnished with double sofa beds. Rooms have private balconies. 42-inch LCD televisions with satellite programming provide entertainment, while complimentary wireless Internet access keeps you connected. Private bathrooms with showers feature rainfall showerheads and designer toiletries. Pamper yourself with a visit to the spa, which offers massages, body treatments, and facials. You're sure to appreciate the recreational amenities, including an outdoor pool, an indoor pool, and a spa tub. This Mediterranean hotel also features complimentary wireless Internet access, concierge services, and gift shops/newsstands. Grab a bite to eat at one of the hotel's 2 restaurants, or stay in and take advantage of the 24-hour room service. Snacks are also available at the 3 coffee shops/cafés. Need to unwind? Take a break at the bar/lounge, the beach bar, or the poolside bar for a tasty beverage. A complimentary buffet breakfast is served daily from 7 AM to 11 AM. Featured amenities include a business center, express check-in, and complimentary newspapers in the lobby. Free valet parking is available onsite.